Gonzaga students and Spokane community members participate in a Dance for Parkinson's class at Gonzaga's dance studio Saturday, Feb. 10. They salute the sun. They pass an imaginary ball of energy to each other, first with their hands, then with their feet. They shush the room. For more than an hour Saturday morning, community members with Parkinson's danced with their loved ones, friends, and students, as they do every week as part of the Dance for Parkinson's class at Gonzaga's dance studio. Parkinson's Disease is an incurable disorder that affects the central nervous system, but it can be helped with medication, and more research is showing dance and music can help reduce the effects of common symptoms such as tremors, stiffness, freezing, or loss of balance. The accessible class eases participants through movements targeted at each part of the body, with participants spending much of the class in chairs, then moving to standing routines by the end of the hour. It's part exercise, part social hour, and part getting in touch with your body, so when Gonzaga sophomore Helen Schantz learned about the class, she knew it'd be great to combine it with Love Your Body Week, a yearly event that was put on at her dance studio back home in Seattle. "It was always just a fun week to connect with other dancers, and just really like set me up for a whole lifetime of appreciating my body and everything it can do for me," Schantz says before Saturday's class. The Seattle event was started in conjunction with eating disorder awareness campaigns, Schantz says. It involves discussion of body image, with a focus on affirming the great things our bodies do for us, something Schantz figured everyone could benefit from, especially people with Parkinson's. "When I came to Gonzaga I learned about Dance for Parkinson’s, which I had never heard of before," she says. "It all fit together for me." So she's leading the charge to bring Love Your Body Week to Gonzaga this week, and for her, the idea to bring the two together came from a very personal place. 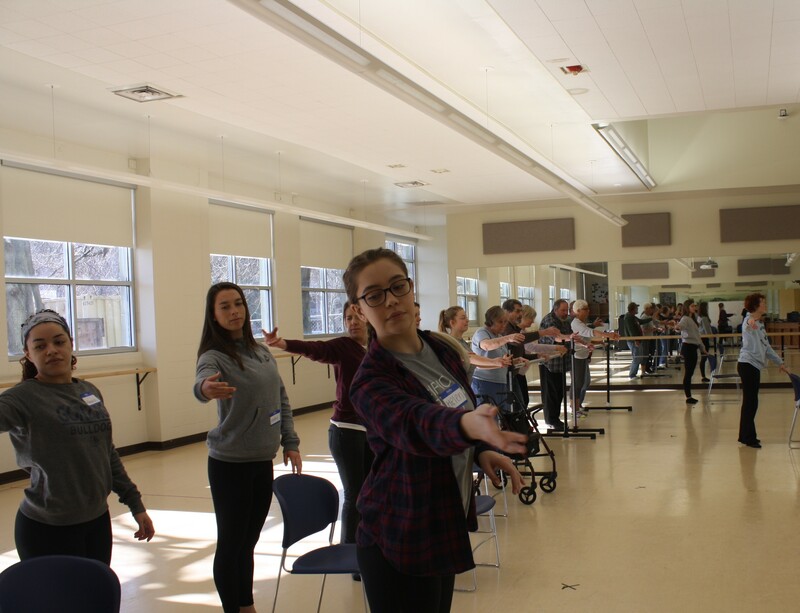 Gonzaga sophomore Helen Schantz helps lead a Dance for Parkinson's class at the school's dance studio Saturday, Feb. 10. "I started thinking about the connection between Parkinson’s and Love Your Body Week in 2014 when my dad was diagnosed with Parkinson’s," she says. "It just completely changed everything for me and how I thought about my body." She was still in high school when her dad, John Schantz, was diagnosed. "Earlier that year I had torn some ligaments in my ankle and I thought it was like the worst thing that could happen to anyone, because I had to not dance on point and all this stuff," she says. "Obviously a diagnosis like that will really bring things into perspective." A list of ways to love your body that Helen Schantz and her dad compiled. Classes such as Dance for Parkinson's not only enable people to get needed exercise, but the social aspect can help with depression, which is a common struggle after people are diagnosed, Schantz says. Her dad does boxing and dance. For him, the progression has been slow, and he's still able to drive and maintain his independence, though he did retire sooner than he planned. Being involved with the dance class, which is sponsored by the Northwest Parkinson's Foundation at no cost to participants, has helped Schantz as she worked through her own reactions to her dad's diagnosis. Initially, she says, there was a fair amount of denial, because there usually aren't very severe symptoms when someone is diagnosed. "It's been such a positive experience for me since it’s helped me accept the reality of him having Parkinson’s and also helped me see people who are in advanced stages of the disease," Schantz says. "I think him knowing that I’m doing this and me knowing that I’m actually trying to make a difference in the lives of people with Parkinson’s, it makes a difference." For participants like Mari Cleveland, the Dance for Parkinson's class is challenging, but a great place to stay active and meet other people with the disorder. She was a teacher in different Spokane schools for many years before retiring at 62. Now 65, she sees the classes as a way to give back, since the dance students get experience teaching, and other Gonzaga students are collecting data on the participants' gait, balance and flexibility before and after each class to see how and whether those things improve. "My big thing is not wanting to be tight, and wanting to have more balance, being able to stand longer," Cleveland says. "So for me this is a push, cause I never did dancing or anything like that." For her, as for many others in the class, medication helps, but it needs to be at the right balance. Since being diagnosed last March, she's been very involved in exercise classes, hiking regularly, and riding a recumbent bike. "Dancing isn’t the only thing I’m doing as far as exercise but it’s fun, so it’s something I like to do," she says. Find more information on the dance class here. Since Monday, Schantz and other dancers at Gonzaga have focused on student outreach and workshops for people with Parkinson's. 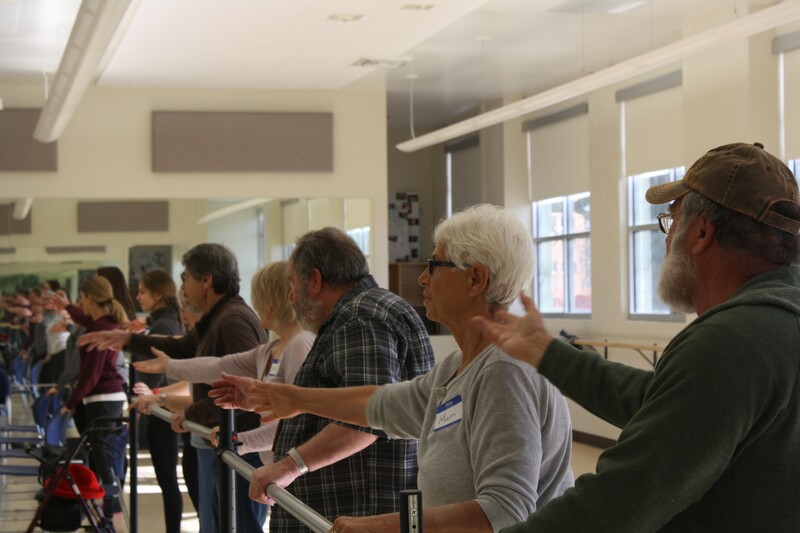 The class is based on a national program, and at the end of the week, David Leventhal, Program Director and founding teacher of Dance for Parkinson's Disease, will be in Spokane teaching dance instructors from the area how to lead the classes. 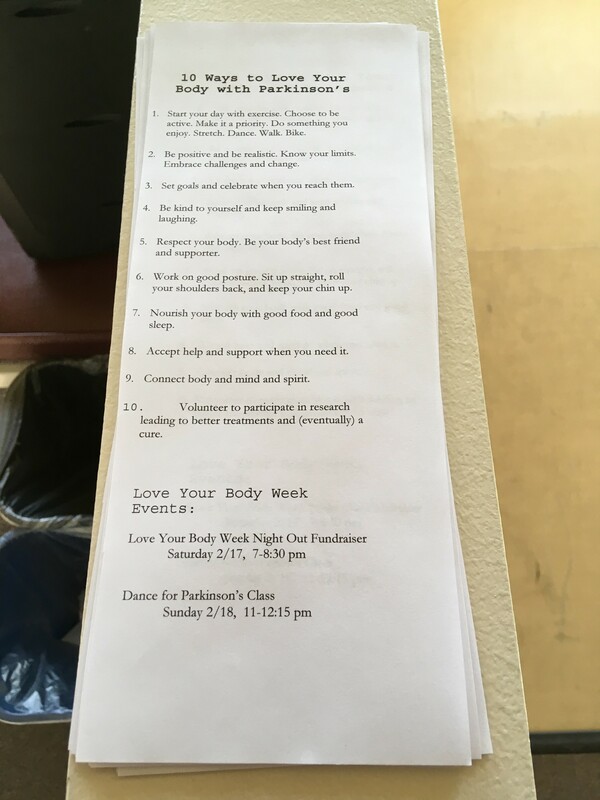 The week culminates with Love Your Body Week Night Out, a night of dancing, desserts and a silent auction fundraiser for the Northwest Parkinson's Foundation. Saturday, Feb. 17 • 7-8:30 pm • Gonzaga dance studio • 1108 N. Pearl St.